The drought experienced during the 2012 growing season in most of Central and Southern Wisconsin has significantly reduced the availability of grains for feed use. Grain production in the Midwest in general has been severely affected by the drought as well, which has worsened feed availability and cost. Given this pressing need, a significant number of acres that were originally seeded for corn grain have been harvested for silage instead. This situation has left a considerable amount of agricultural land bare and susceptible to erosion. Although the effects of soil erosion on productivity can vary between years due to rainfall differences, soil erosion over time will reduce a land’s yield potential. Research has shown that corn yields in eroded land can be between 10 to 30% lower when compared to un-eroded soil. Typically, yield reductions in eroded fields are more severe in dry years. This is due to a reduction in rooting depth and an overall reduction in the amount of plant-available water the soil profile can hold after it has been eroded. Further, nutrients and organic matter are lost during the erosion process. In general, erosion diminishes soil quality. Approximately 5% in crop productivity is lost for every inch of soil eroded, but often the yield reduction can be greater. This might not seem like a lot, but these losses add up from one year to the next. Also, consider that it takes between 200 to 1,000 years for an inch of soil to form (this mainly depends on the climate and the rock parent material). How Can a Cover Crop Help? Very little plant residue is left on the soil surface after silage harvest. Plant residue protects soil particles from detachment created by raindrop action by dissipating its energy. Soil particle detachment is the first step in water erosion. Also, crust and surface seals can develop when raindrops hit bare soil surfaces, reducing water infiltration and increasing runoff volumes. As runoff potential increases, the possibility for rill and gully erosion intensifies. Cover crops can help by replacing the lost plant biomass during harvest. This is especially critical during late winter and early spring. Cover crop species that produce large amounts of biomass in a short period of time are recommended for soil protection. Winter cereal rye, annual ryegrass, winter wheat, barley, and oats are good options. The idea is to create as much surface cover in a brief period of time. Additionally, these cover crops help reduce nutrient losses since they serve as trap crops; plus they can help suppress some weeds. Drilling is the best way to establish a cover crop as it provides more consistent coverage and seed germination. However, drilling requires more labor and time. Broadcasting cover crop seed is another alternative, but seeding rates need to be increased by about 10 to 20% to have a good stand. Aerial seeding is another option, but rates need to be increased even further. Early establishment of these cover crops is critical, but most can still be planted until mid- to late-September. Summer annual cover crops such as annual ryegrass, oats, and barley may be better choices if planting in early to mid-September. If planting is delayed past mid-September, winter annual cover crops such as winter rye and winter wheat become better options. Some legumes can also serve as cover crops and help control erosion, but typically these need to be established by the middle of August. Table 1 shows some establishment and characteristic information for certain cover crops species suitable for erosion control. Table 1. General establishment and performance information for some cover crops suitable for soil erosion control in Wisconsin. Information adapted from the Midwest Cover Crop Council (http://www.mccc.msu.edu). One of the main benefits of cover crop use is that it prevents soil particles from detaching, therefore reducing erosion. Similarly, reducing the amount and intensity of tillage will reduce soil particle detachment and erosion. It is recommended to minimize the amount of fall tillage as much as possible, especially when very little crop residue is left on the soil surface, to reduce the potential for an erosion event to occur. main/national/programs/financial/eqip/ and your local NRCS Service Center. Figure 1. 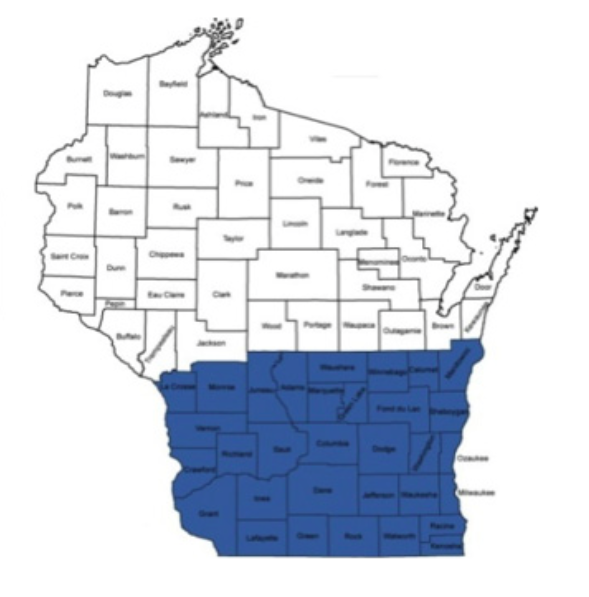 (Right) Drought-affected counties eligible for the special 2012 Environmental Quality Incentives Program (EQIP) cover crop sign up from NRCS (source Wis. NRCS).